ARCADIUS, a distinguished Christian member of society in Cæserea the capital of Mauritania Caesariensis (present-day Cherchell, Algeria) who went into hiding during a period of persecution. The authorities arrested a member of St. Arcadius’ family, threatening to torture him unless St. Arcadius surrendered. St. Arcadius presented himself to the authorities forthwith, and was told all would be released if he would simply make a public sacrifice to a pagan god. St. Arcadius rejected the offer and was slowly hacked to death, circa 302. BENEDICT BISCOP, St. Benedict Biscop was a Northumbrian of noble birth, who spent his youth at the court of King Oswiu. Returning from his second pilgrimage to Rome, 666, he became a monk at Lérins. Three years later, he accompanied St. Theodore (19th September) to Canterbury, where he became Abbot of the monastery of SS. Peter and Paul (later St. Augustine’s). He went on to found the monasteries of St. Peter at Wearmouth (674) and St. Paul at Jarrow (682). St. Benedict was an ardent advocate of Roman liturgical practice, and was well known for his enthusiasm for art and learning, returning from each of his five trips to Rome with numerous paintings, relics, and manuscripts. He was responsible for bringing John the Archcantor of St. Peter’s in Rome to England to teach Roman chant, and is said to have introduced the use of glass windows and stone in the construction of English churches. St. Benedict’s Life was written by St. Bede the Venerable (25th May), who was St. Benedict’s charge from the age of seven. CAESARIA, the sister of St. Cæsarius of Arles (27th August). Her brother appointed her Abbess of the Monastery of St. John which he had founded, and during her tenure the community grew to several hundred nuns. SS Gregory of Tours (17th November) and Venantius Fortunatus (14th December) described her as possessing outstanding gifts, St. Caesaria was renowned for her devotion to the poor, sick, and children. St. Caesaria reposed circa 530. JOHN of RAVENNA, the Bishop of Ravenna in Emilia-Romagna from 452 until his repose in 494. St. John is remembered for protecting his flock from the savagery of Attila the Hun and secured better conditions for Ravenna after it had been occupied by Theodoric the Great, King of the Ostrogoths (r. 475–526). PROBUS, a late sixth century Bishop of Verona of whom nothing further is known. TATIANA and COMPANIONS, a renowned virgin-martyr from a prominent Roman family, and most likely a deaconess. 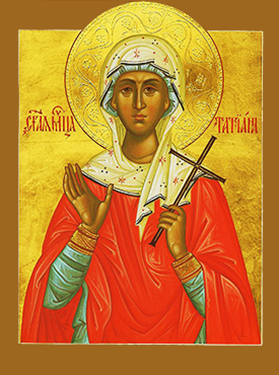 St. Tatiana and others were martyred the persecutions during the reign of Emperor Severus Alexander, circa 226. VICTORIAN of ASAN, a founder of monasteries and hospices in Italy. St. Victorian travelled west, spending time in France, and then to the Spanish Pyrenees where he founded and served as first abbot of a monastic community at Asan, now known as Monasterio de San Vitorián. St. Victorian reposed circa 560. ZOTICUS, ROGATUS, MODESTUS, CASTULUS, and COMPANIONS, (Date Unknown), a group of forty to fifty soldiers martyred in North Africa. Nothing further is known of them.